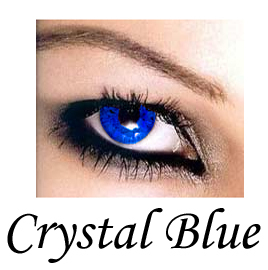 Dual Chrystal Blue Colour Lenses, as the name suggests, feature a dual-layer colour pigment, instantly making your eyes look bigger and more attractive. These lenses provide more colour definition and deeper contrast than standard single-colour lenses. These lenses are suited to those wanting a more vibrant, richer colour change. Each Box of contact lenses comes with 2 lenses in one box. However you may have a different prescription for each eye. If so then please select the power you require for each eye. If you are getting the lenses for cosmetic appearance only and do not need the lenses to improve your vision then please select "0 Non Prescription". Want striking clear blue eyes? Your wish is our command here at cococontacts.com. The Dual Crystal Blue colored lenses feature a 2-layer color pigment that provides more definition and contrast than single-colored lenses in the market. It gives a richer and more vibrant blue color to your eyes. Coco Contact’s Wild lenses are meant to be worn solely for cosmetic purposes. They do not come with prescription and will not improve your vision in anyway. Please do not wear them on top of other lenses and closely follow the guide on how to wear, clean and use them. They expire 90 days after opening the box. Visit an optometrist every 2 years to ensure the health of your eyes. These lenses can be cosmetic contact lenses or you can get them with a prescription. To specify the prescription, please state your prescription in the comments when completing your order and please allow an extra week for shipping in case we do not have your prescription in stock.